Hint: You’ll become a better runner! As runners, we understand the value of our legs and our feet. But your ankles deserve respect as well. Here, Goolsby and two other experts share exactly what you’ll gain when you give your ankles the attention – and respect – they deserve. The most common type of ankle injury is classified as “inverse,” meaning the sole of the foot twists inward. About 80 percent of ankle injuries fall into this category, explains Dr. Steven Weinfeld, Chief of Foot and Ankle Surgery at the Icahn School of Medicine at Mount Sinai. This can happen when you take a misstep while running (or even walking) that rolls your foot in underneath your ankle. 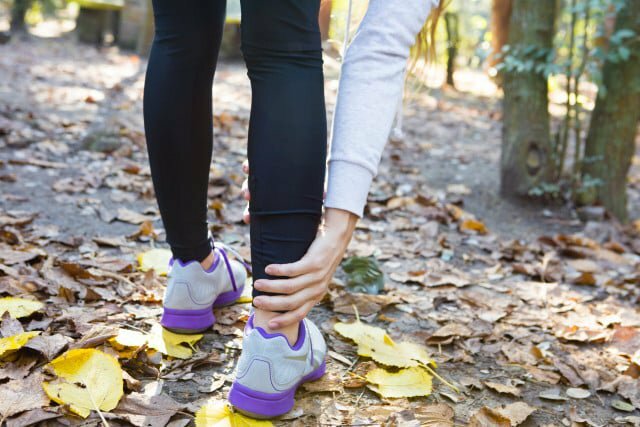 Having strong muscles surrounding your ankles (the ankle itself isn’t a muscle) can help prevent this type of injury, commonly known as a sprain. Two other common injuries that result from your foot twisting inward: Achilles and posterior tibial tendinitis. When your foot pronates (or rolls inwards), it puts undue stress on the surrounding tendons. “With repetition, this causes micro-tearing [also called tendinitis],” explains Dr. John Jachimiak. This tendinitis can damage your Achilles as well as your posterior tibial, the tendon that attaches the calf muscles to the bones on the inside of the foot. Watch: Dr. Jordan Metzl shows you how to treat and prevent the dreaded Achilles tendinitis. A weak, misaligned ankle can stress the adjacent joints, including your knee, hip and lower back, says Weinfeld. “If something is off or abnormal anywhere along this kinetic chain and you are asking your body to do an asymmetrical sport like running, you will likely see injuries elsewhere,” adds Goolsby. “Most people – including elite athletes – have deficiencies in ankle strength,” says Jachimiak, who notes that when it comes to running, stronger muscles around your ankles mean more power, agility, and mobility out on the road. “There’s a certain amount of strength needed to walk in high heels,” explains Weinfeld. Having strong muscles around your ankles will minimise the risk of rolling your ankle while sporting such shoes.